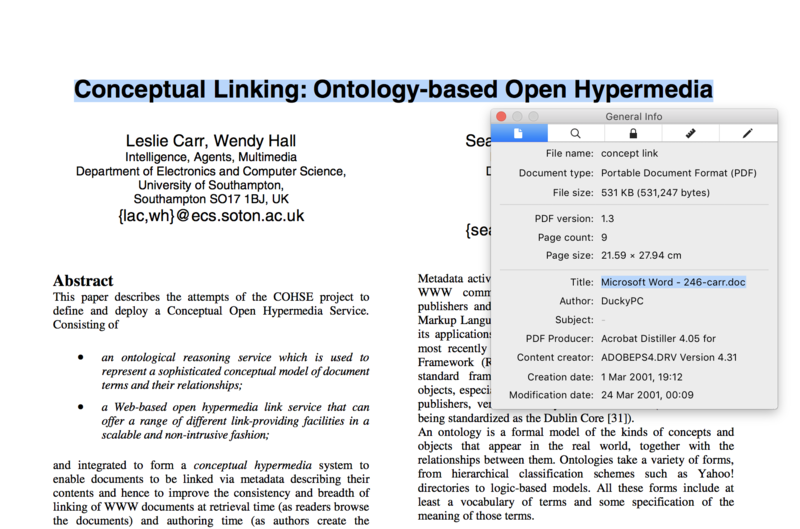 The user would drag & drop PDFs onto this app (or use a web service) and the system would extract the name of the document (which often the name of the document is not) and search Mendeley (as example below) to extract citation information (author, publisher, year etc). Search results are shown in a dialogue. If none are found or if they are wrong, the user can manually type in the name of the document or paste it. It will then assign the found Name as the document name and assign other citation information inside the PDFs meta information, for use by other applications, as shown below. This will allow applications like Liquid | Author and others to easily allow the reader to copy text As Citation, saving potentially massive amounts of time.